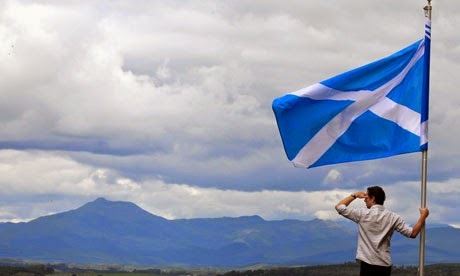 Simon King's written outpourings: Go for it, Scotland! The question of Scottish independence has instigated universal interest and debate. It has prompted cod analysis from the most unqualified of sources. Although the NO campaign is still on the lead, Alex Salmond seems much more wily than the desiccated Alistair Darling. Although Salmond's statements and policies tend to be populist, he is a left-leaning politician who has chimed with the public in a way that Ed Miliband has persistently failed. There is no question that, if Scotland were to become independent, it would face serious hurdles. There is the question of currency, an over-reliance on oil as an export, EU membership and the prospect of stagnant growth. If Scotland became autonomous it would have to sift through an endless array of bureaucratic reforms, which the NO campaign claims would take longer than the proposed eighteen months. People insist that the union is the biggest source for jobs and growth. Though one of the strongest claims made by the YES campaign is a vote for independence would be democratic. Scotland is a Labour strong-hold and is intent on maintaining institutions like the NHS (which is surreptitiously being privatised) and child care benefits. Scotland bears the brunt of policies like the bedroom tax, which is a deterrent to social mobility. Social institutions they cherish are being cut at break-neck speed. Scotland has not voted for any of these policies, yet they bear the brunt of them. It would make sense that more powers should be devolved to Scotland. All political and economic power is centralised in London. When people talk of meager economic growth (which are actually lower than 2008 levels), this all takes place in London. Areas in the north and the midlands are stagnant It would make sense to have some sort of regional federation. The original proposal made by Salmond and SNP was 'devo max,' which was snubbed by Cameron. This meant that the only tenable alternative to the SNP was full sovereignty. The central ethos behind Cameron's otherwise rather pallid campaign was 'the big society' and British identity. It has only led to more frissures. If he loses Scotland, his term will be considered a disaster. He may even be pressured to resign. Scottish independence has instigated fierce public debate. So much so that it has even sparked tensions within family house-holds. It cannot be easily delineated as a left/right dichotomy either. Although Salmond's rhetoric is largely anti-Tory, people from varying persuasions support each ticket. The great thing about the referendum is that it has summoned interest from the most politically apathetic. It has risen the public morale. This means that, even if NO claims a majority, the YES campaign may still be the real winner. It has caused an indelible change of mood. All the arguments posited above will continue to be discussed and will continue to resonate. There will be more referendums in the future. Scottish independence will continue to be a strong sentiment and will continue to be a scourge to the Tory right.